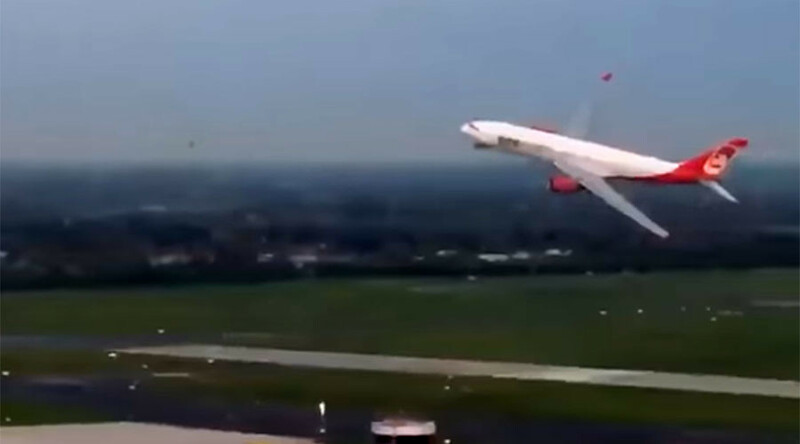 An Air Berlin flight from Miami to Dusseldorf, with 200 passengers on board, made a dramatic flypast over the terminal at its destination to mark the airline's final flight. Now, an investigation has been launched into whether the pilot endangered any lives. The German Aviation Authority (LBA) has begun an investigation into the incident, which was captured on camera and shared extensively online. “Air Berlin fully supports the LBA in its work,” the company said, as cited by The Local. The financially troubled company allegedly requested permission to conduct the flypast in case of an aborted landing at the airport, reports The Local. The plane eventually landed safely and no official complaints have so far been lodged. "That was a go-around maneuver. The Federal Aviation Office is examining the incident," a spokesman for Air Berlin said Tuesday, as cited by Reuters. The spokesperson did not provide any further details, apart from confirming that the flypast was a preplanned "lap of honor." "We are awaiting the results of an internal investigation at Air Berlin," a spokesperson for the LBA said. Go-around maneuvers are frequent occurrences in the aviation industry, as adverse weather conditions often force pilots to postpone landings. German paper Tagesspiegel reports that the airport fire brigade conducted its own farewell ceremony, spraying the Airbus A330 with fire hoses as it was taxiing to the gate after its final voyage. Air Berlin declared bankruptcy on August 15 and was kept flying by a government loan until a buyer could be found. A €210 million ($247 million) bid by Lufthansa last week was accepted.